The Cambridge Darkroom was something of a paradox. It was small, under-funded, provincial and committed to its local and educational roots, yet for much of its life it enjoyed a national and international reputation at the forefront of photographic art practice. The latter was achieved by a deep – though by no means exclusive – concern for the more conceptual uses of photography and the development of photography’s links with the other visual arts. And crucially, this latter was underpinned by the former, a solid foundation of local support. Achieving all of this required a commitment to originating major new exhibitions (especially group shows like Re-Visions, that explored the gallery’s all-encompassing view of photographic practice), a creative selection of touring shows from established artists known to the general public, historical work, and shows by emerging local artists. 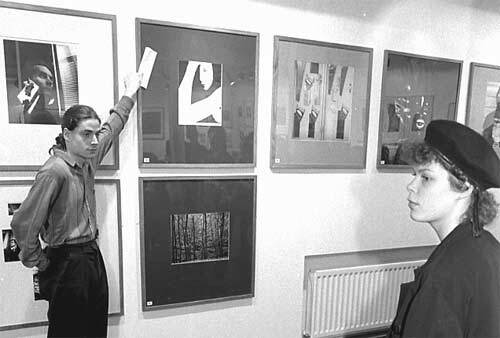 The Cambridge Darkroom prided itself on maintaining strong links with the local community. 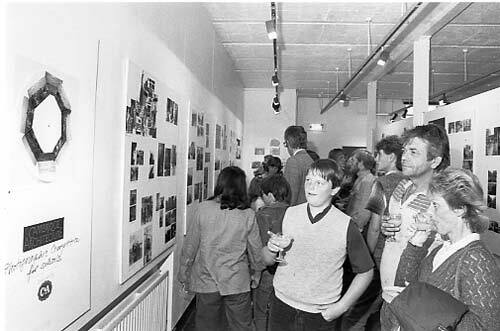 This picture records the ‘Schools Show’ exhibition of July 1984. Much of this success must be attributed to the work of Mark Lumley and Pavel Büchler, whose vision and commitment guided the course of the gallery in the first five years and built the foundation to sustain its success through to the end of the century. They and their successors were supported by equally committed teams of education officers, administrators, technicians and invigilators. Behind the scenes were the directors, members and volunteers, who gave their time and expertise freely. “For many of us, the eighties were the decade during which photography in Britain put aside its macho sixties image, gave up a set of largely parochial concerns, and came to accept, however reluctantly, that medium specificity was no longer the unifying force it had been in the past. The changing nature of the Darkroom in the late 1990s and its ultimate closure in 2004 remain to be fully documented, explained and discussed. Some of the reasons for its dissolution may lie in cultural changes, just as such changes accounted for part of the early success. But from the perspective of two of the founders, we would also look for the causes in the loss of the inclusive view of photography as an accessible and creative medium, the possible failure to maintain a solid base of local and regional support, and of course to the decline in public subsidy that led to the loss of many other worthy institutions around that time. But times change, and maybe the Darkroom’s time was up. This is a doubly partial view of the Cambridge Darkroom: partial in the sense that there is more information still to be gathered; and partial in the sense that we were, and are not, disinterested bystanders. We invite and would welcome comments and information that will make this history both more complete and more impartial. If you can add to this history of the Cambridge Darkroom – or provide any information on The Institute of Visual Culture – please get in touch.